The Trinity refers to the Father, Son and Holy Spirit the 3 Persons in 1 God. This defininition of God involves three consubstantial persons or hypostases. 2. Where does the Word Trinity come from? The word "Trinity" comes from the Latin noun "trinitas" meaning "three are one." It was first introduced by Tertullian at the end of the 2nd century. 3. Do all Christians accept the Trinity? Yes, the doctrine of the Trinity is Key to the Christian Faith however, some non-Christian churches reject the doctrine of the Trinity including The Church of Jesus Christ of Latter-day Saints, Jehovah's Witnesses, Christian Scientists, Unitarians and others. 4. Is the Trinity a Mystery? 5. Where does the Trinity appear in the Bible? 6. Is the Trinity One or Three Gods? CCC 254 The divine persons are really distinct from one another. "God is one but not solitary. "86 "Father", "Son", "Holy Spirit" are not simply names designating modalities of the divine being, for they are really distinct from one another: "He is not the Father who is the Son, nor is the Son he who is the Father, nor is the Holy Spirit he who is the Father or the Son. "87 They are distinct from one another in their relations of origin: "It is the Father who generates, the Son who is begotten, and the Holy Spirit who proceeds. "88 The divine Unity is Triune. 7. Is the Trinity found in the Old Testament? Yes, the Old Testament has Bible Verses referring to the Trinity including Genesis 1:26, Genesis 3:22, Deuteronomy 6:4. 8. What is the Nicene Creed? 9. Has the Church always believed in the Trinity? 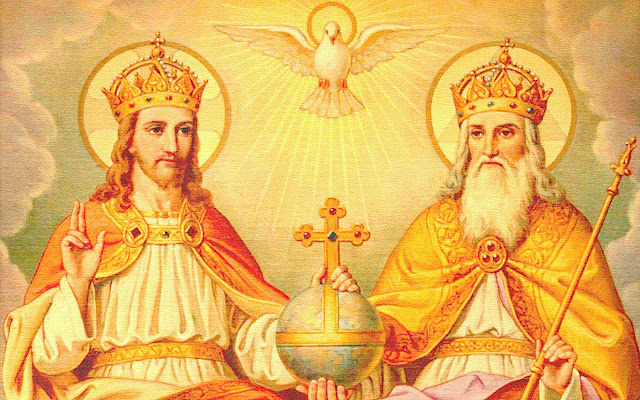 Yes, the Catholic Church has always believed in the Trinity. The Solemnity of the Most Holy Trinity was established as a Double of the Second Class by Pope John XXII it is celebrated on the Sunday after Pentecost. It was made a Double of the First Class by Pope Pius X on 24 July 1911.The liturgical color is white. 10. When was the term Trinity first Recorded? The first time the Greek word was used was in the works of Theophilus of Antioch in about 170. In like manner also the three days which were before the luminaries, are types of the Trinity [Τριάδος], of God, and His Word, and His wisdom. And the fourth is the type of man, who needs light, that so there may be God, the Word, wisdom, man.